It has been quite a long time since we heard anything new from Cherry Mobile. I know they released their own dual camera wielding smartphones like a few weeks ago, that did not make a lot of noise since almost every company we know are also releasing their versions of dual camera smartphones. But apart from that, nothing really new and exciting has been heard from Cherry Mobile. 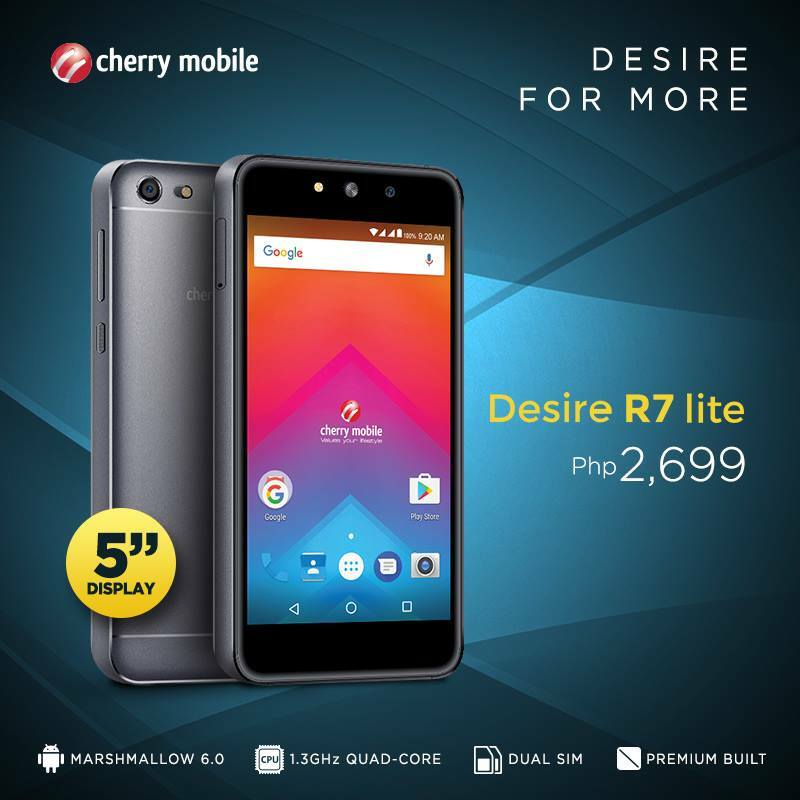 Today, that may change though as the company has just launched brand new offering in the budget segment with the official announcement of the Desire R7 Lite. The Cherry Mobile Desire R7 Lite is a Php2,699 smartphone sporting a 5-inch display with Android 6.0 Marshmallow running inside it. CM did not specify how much resolution it has, but given it's only priced for less than Php3K, we can assumes it's going to be under 720p (or even lower). It has quad-core processor alongside its 512MB RAM and 8GB default storage space with support for microSD card for additional memory. Camera resolution is also one of those missing details on this Desire R7 Lite. And even the battery size was not mentioned on the announcement that was made on Facebook page of Cherry Mobile. I guess you will really need to visit one of their concept and retail stores to learn more of those information about this smartphone, as it is now available for purchase. But according to YugaTech which seemed to have encountered the Cherry Mobile Desire R7 Lite at a CM store, the device has 854 x 480 resolution, 5MP+2MP camera configurations, and 2200mAh battery pack. Again this smartphone is now available at store for only Php2,699.